Welcome to Arizona, a state of unusual natural formations that allures millions of people from all over the world. The first place to see here is of course the famous Grand Canyon. However, it should be not the only destination on your ultimate Arizona itinerary. This is especially true if you want to get of the beaten path and explore more of this southwestern state. If that’s the case, we firmly believe that spending one day in Page, Arizona is an absolute must. To prove this, two weeks ago we undertook our longest road trip and crossed three states in one night. Driving almost nonstop for nine hours from Los Angeles to Arizona is never easy. But it always pays off tenfold. Without further ado, let’s share our complete itinerary for one day in Page, Arizona. There are so many options to start your one-day adventures in Page. Many visitors prefer to stay in a city or town nearby and venture to Page for the day. Our plan was to spend a night in the city and start the journey the next morning. We booked rooms at a budget hotel/motel, Canyon Inn. Nothing fancy, but it gave us place to rest, refresh, and reach the first place on our Page itinerary in less than 15 minutes. The next morning, we left the motel around 8:00 a.m. and started our one-day in Page, Arizona with Antelope Canyon. Unfortunately, at this time any sunrise trips are out of the question for us no matter how gorgeous they are. When traveling with children, you have to make sure that they sleep enough. Otherwise, you set yourself for a long, lousy day with the kids crying and whining all the time. The place has two canyons: Upper Antelope Canyon and Lower Antelope Canyon. They are pretty similar and differ mostly in their inner structures, forms, and shapes. Upper Antelope Canyon is the most visited of two of them. Moreover, there is no age restriction. 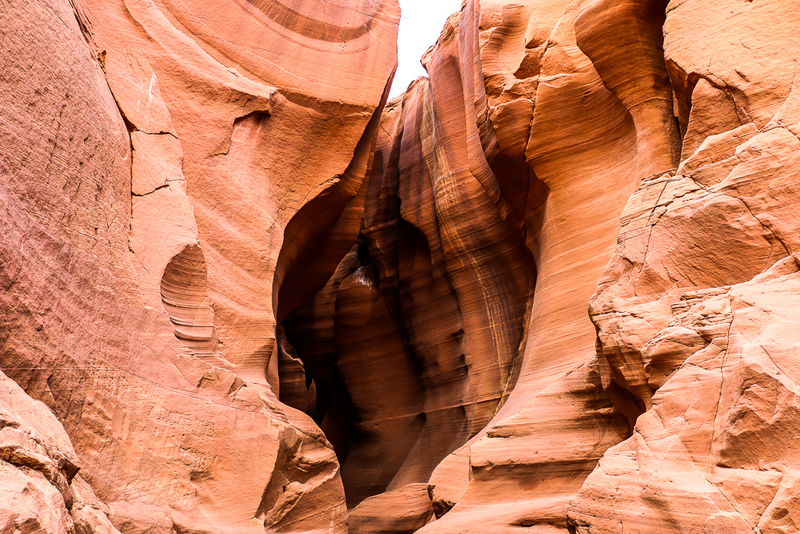 Everybody from infants to adults and seniors can put this place on their personal itinerary for one day in Page, Arizona. Lower Antelope Canyon is open only for people of six years of age and older. You have to take a tour. Only guided tours are allowed inside the canyons. A tour usually lasts one hour and a half. 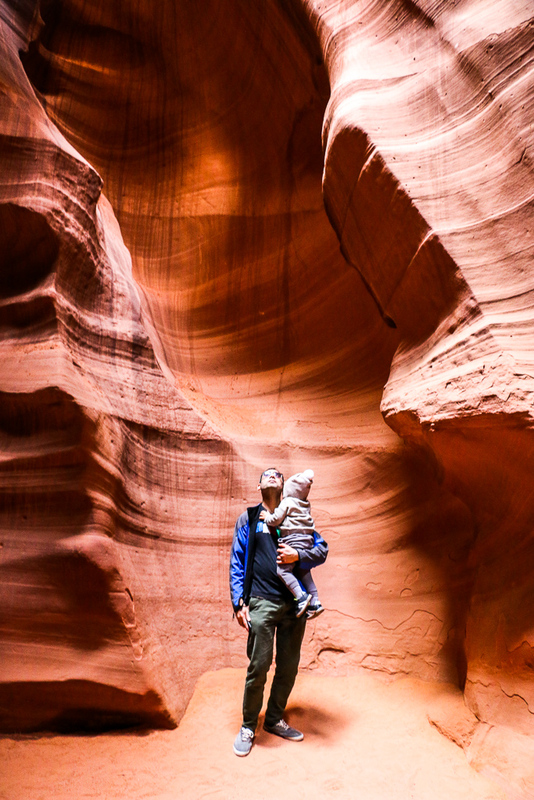 With the young kids, we could visit only Upper Antelope Canyon. Our tour was schedule for 10:00 a.m. At this time, George, our guide drove us about three miles to the entrance of the canyon. From there the journey continued on foot with George guiding and narrating our little adventure from the start to the end. From a short introductory, it was obvious that our tour guide was a very skillful photographer. He did such a great job showing us all tricks with lighting and places to take the best pictures inside Antelope Canyon. The second place on our one-day in Page itinerary was undoubtedly Horseshoe Bend. Normally, we would’ve parked just a few feet from a short hiking trail to this remarkable Arizona attraction. But since the parking lot was under construction, all visitors had to leave their cars about a mile further down the road and take Horseshoe Bend shuttle. The ride didn’t take more than five minutes and costed $5 for a round trip. When we finally got off the shuttle, a well-trodden trail to the left led us the famous site of Arizona. In majority of times, bright colors on Instagram pictures don’t represent the actual colors of the nature. So I was ready for slightly less impressive images of Horseshoe Bend compared to its social media and online versions. But even one day in Page made me realize how mistaken I was. The place was absolutely incredible. 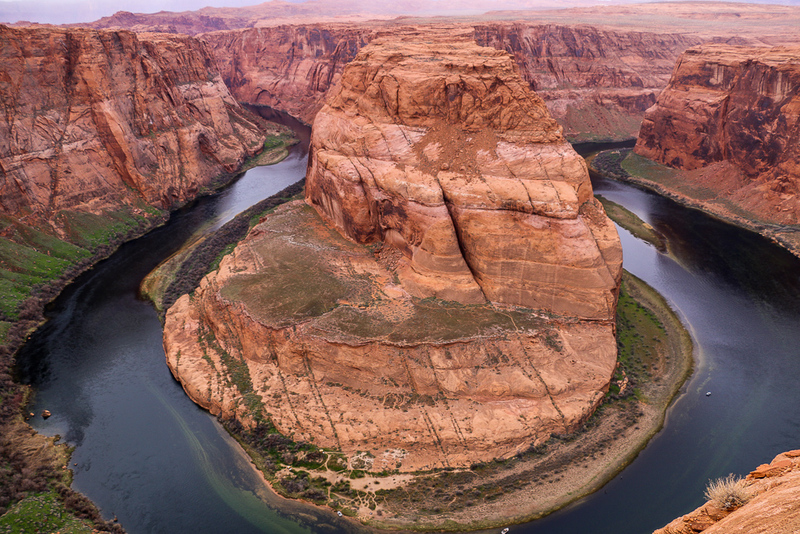 Yellowish rocks, massive cliffs, and blue green waters of the Colorado River makes Horseshoe Bend one of the must-see destinations when visiting Arizona. We spent quite a while here as opposed to planned 30 to 40 minutes. Almost half of the time was devoted to taking enormous amount of pictures. So gorgeous was the place. The rest of the time we climbed the rocks and couldn’t get over the incredible miracles the nature creates. After such a beautiful day in Page, we were running out of time. A long ride to Sedona still awaited us. 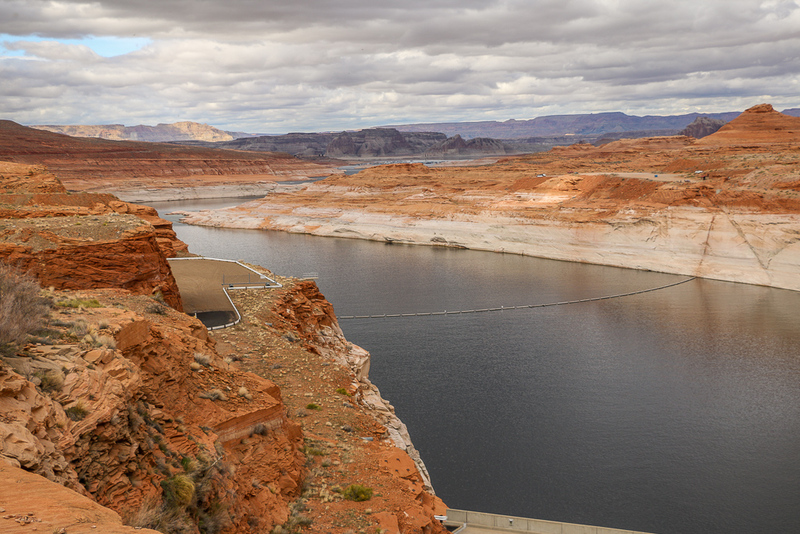 With limited time on our hands, we made a quick stop at Lake Powell. Unfortunately, we couldn’t rent a boat or kayak and explore it deeper. Nevertheless, even a leisurely walk on the shore was enough to show the magnificence of the lake and its surroundings. I appreciate your sharing. I must say that your shared information is very useful for me as well as other visitors. I also have a plan to go there in this weekend to enjoy some time with my buddies.